The artist for 30 years has explored the diversity of elements, where she creates and complements together with drawings in order to express social impacts of great importance in Colombia. Johanna Calle exhibits some of her most important artworks in the exhibition Silentes, where the artistic research is intervened and details acquire value. After a walk in the Art Museum of the Bank of the Republic (Bogotá, Colombia), you can find in its interior an exhibition that regains the sense of an artistic activity relatively related to the spirit of the freedom of expression: the exhibition is called Silentes and it will be open to the public until February 7th. There, Johanna Calle owns the space with the retrospective of the work she had in 1985. That retrospective also encompasses the work she has nowadays. 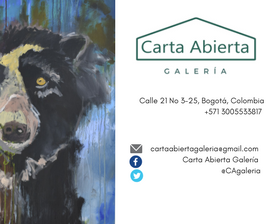 She shows appropriate artworks that are very important to the Colombian artist. It’s not enough to see her artworks panoramically; when you meticulously get closer, you can see the details, which are those fragments of history that acquire great transcendence, when going back in time for some seconds to the Colombian past. The artworks in big format surprise and some of them are the trees of the series Perímetros, Dominios, or Lindes (2013-2014). These are made with pages of property registers that are absolutely empty and the artist filled them with the typing of the Victims’ Law. By doing that, she created trees, which are the analogy of the land. Her series that are inspired on language such as Lluvias (2013), Norma (2007), Partitura (2013), or Torrencial (1999) establish the position of words, speeches, and lost dialects that have great value. The topics that the artist deals with awake such interest that she is able to submerge herself in every research, like in her series Nombre propio. Nombre propio is a follow-up of 1997 about the abandonment cases that were notified by the Institute for Family and Child Well-Being. The artist wanted to demonstrate this by means of the knitted faces of children in some kind of family tree. How does the drawing become a way to put in evidence the issues that relate the Colombian society? The drawing has certain austerity that to me seems to be relevant when dealing with this kind of topics. At the beginning of my career, I explored how to create an assembly and then I tried to experiment with something closer to paintings than drawings. However, in the latest 25 years the main focus has been the drawing in its broadest definition, because in that definition I experiment every day in order to find new dimensions of it. I draw with non-conventional materials. How did you determine the material that you use to reflect your artworks? Maybe it depended on the conceptual topic that you are going to develop? Certainly. The research or the conceptual topic determines the material. Part of the research process of my artworks is to determine which material is the most suitable to deal with the topic in a symbolic way. I spend months researching materials and creating questions about ductility, resistance, and tools that allow a better use and specially its conservation. I tried to avoid the ephemeral. I don’t obtain a result in the first try. One of the advantages of art in relation to research projects is that these can continue in time indefinitely. For decades I have done research about some topics and that strengthens the approaches, the techniques, and sometimes the results. These are 30 years of career where you have amazed everybody with your artistic work and where you have also dealt with controversial topics in Chile. How do you see the evolution of those topics in topics like peace and the Victims’ Law? The Victims’ Law came into effect in 2012 and is about a transitional justice. Therefore, is too early to talk about evolution. The effects and the approaches of the Victims’ Law can be seen and analyzed with time. The Peace Dialogue are in process and, like most Colombians, I’m eager for it. In Colombia there are more than four important guerrilla groups. The Peace Dialogue is ahead of them just a little. If you use basic mathematics to this approach, the result is a little discouraging. The combinations of the elements that constitute your artworks represent the social realities that you want to pose. Are these elements –like documents or names –an important point in your artworks? They are not only important, but fundamental. I do not believe in inspiration. My artworks are the result of research processes that fervently discuss with the research processes of materials. The documentation in the study of problems is extensive. Sometimes my husband, Julio César Pérez N., and I acquire full archives of the documentations about a research topic; archives that require analysis and work in order to classify, organize, and decipher the grammar, the authorship before you can understand its context. In this process, I find important elements that I can mention in my artworks. How is it possible for you to complement these elements and form and artwork that can be read anyway? There are no formulas. There is not a single method, but many methods. The oral and written languages have been an issue in many of your projects such as Lluvias, Norma, Partitura, of Diálogos. How do you appropriate this language and reflect it on you artworks? I don’t own the language. I am interested on the elements of language like the sign, phonetics, grammar. I have studied language and its problems for years and I think that I will continue doing that while I’m alive. Your most recent artwork touches upon the topics of botany, nature, and ecology. Which were the situations that led the revitalization of these topics in your artworks? Some time ago I’ve been worried about the types of chemicals that are supposed to eradicate the illicit crops. I’m doing research about this and I am getting worried even more. The war against drugs seems a struggle against the environment. How was the first approach with the social aspects that defined your artistic work? I think that all topics are social because these are registered in a city, country, or social group. Politics, public policies, women’s rights, peace, and abuse are social topics. Would you define your work as a type of social art? It’s just art. I only aspire to be an artist with no labels and classifications either. I just create art and that’s all. The others are people who try to put you or your work in a classification. I define myself as a female artist and from that point I start my definition.